The trainer and training were good. I enjoyed it a lot! Irvine, a planned city in Orange County, California, is known for the presence of corporations in the fields of technology and semiconductor sector with their national and international headquarters. This city and its urban core are developing with advancements in technology and providing plenty of opportunities for individuals with technical skills. KnowledgeHut provides the CSD certification in Irvine through classroom sessions to aspiring candidates in the city. CSD training in Irvine is a 5-day course conducted by experienced tutors. The coaching begins with an introduction to CSD basics on Agile; Scrum Fundamentals, Roles, Ceremonies, and Sprint. It also covers CSD elective topics, which include Acceptance Test Driven Development, Behaviour Driven Development, Gherkin, Fitnesse and Selenium. CSD certification in Irvine takes into account SOLID design principles, learning of various patterns and collaboration skills. In the last phase of the training, the CSD course in Irvine lays emphasis on Continuous Testing, Inspection, Deployment and Feedback, Demo and Exercise on Continuous Integration, TDD, and Refactoring. 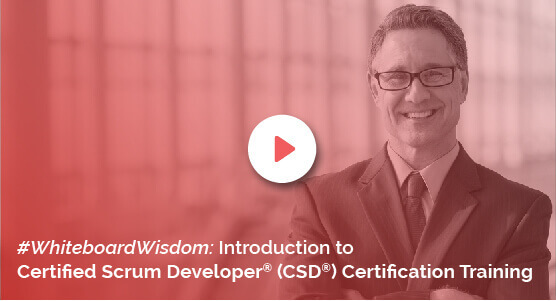 The CSD training in Irvine, by Knowledgehut Academy, offers a wide range of benefits including the credit of 40 PDUs and 40 SEUs, Certified Scrum Developer Certificate, Scrum Alliance approved course material etc. The comprehensive course material and intensive workshops will prepare you to handle tasks such as Pair programming, Object-oriented techniques and use ample design alternatives. Participants will be able to ace the concepts and establish themselves as certified experts with required credentials. The Certified Scrum Developer Training in Irvine by Knowledgehut is imparted through advanced diverse training delivery formats and the biggest advantage is its competitive cost. To explore more about institute’s Certified Scrum Developer Certification in Irvine, register for a demo session.